It all comes with the same permissible license as OpenNRW’s data. This is open data madness! Everything you could possibly hope for presented via a very functional download portal. Kudos to TLVermGeo (“Thüringisches Landesamt für Vermessung und Geoinformation”) for creating an open treasure cove of free-for-all geospatial data. Zooming in get us to the tiles. The city of Weimar. famous for Goethe, Schiller, Bauhaus, and National Socialism. We zoom to the nearby forested area called “Buchenwald” (meaning beech forest). This is the site of the former Buchenwald concentration camp. 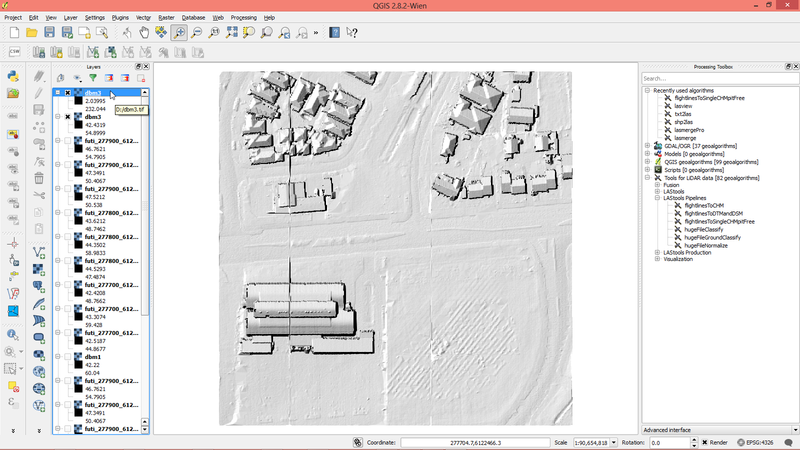 We are downloading LiDAR data around the Buchenwald concentration camp. According to Wikipedia, it was established in July 1937 and was one of the largest on German soil. Today the remains of Buchenwald serve as a memorial and as a permanent exhibition and museum. Next we will run a few quality checks on the 15 tiles by processing them with lasinfo, lasoverlap, lasgrid, and las2dem. We output all results into a folder named ‘quality’. With lasinfo we create one text file per tile that summarizes its contents. The ‘-cd’ option computes the all return and last return density. The ‘-histo point_source 1’ option produces a histogram of point source IDs that are supposed to store which flight line each return came from. The ‘-odir’ and ‘-odix’ options specify the directory for the output and an appendix to the output file name. The ‘-cores 4’ option starts 4 processes in parallel, each working on a different tile. With lasoverlap we can visualize how much overlap the flight lines have and the (potential miss-)alignment between them. We drop the synthetic points with point source IDs 1 and 9999 and add geo-referencing information with ‘-epsg 25832’ so that the resulting images can be displayed as Google Earth overlays. The options ‘-min_diff 0.1’ and ‘-max_diff 0.4’ map elevation differences of up +/- 10 cm to white. Above +/- 10 cm the color becomes increasingly red/blue with full saturation at +/- 40 cm or higher. This difference can only be computed for pixels with two or more overlapping flight lines. Flight line alignment: white is good. red/blue is bad. With lasgrid we check the density distribution of the laser pulses by computing the point density of the last returns for each 2 by 2 meter pixel and then mapping the computed density value to a false color that is blue for a density of 0 and red for a density of 10 or higher. Pulse density variation due to flight line overlap is expected. But also the contribution of flight turbulence is quite significant. With las2dem we can check the quality of the already existing ground classification in the LiDAR by producing a hillshaded image of a DTM for visual inspection. Based on our initial guess on the classification codes (see above) we keep those synthetic points that improve the DTM (classification codes 16, 17, and 18) in addition to the ground points (classification code 2). Problems in the ground classification of LiDAR points are often visible in a hillshaded DTM. Wow. We see a number of ground disturbances in the resulting hillshaded DTM. Some of them are expected because if you read up on the history of the Buchenwald concentration camp you will learn that in 1950 large parts of the camp were demolished. However, the laser finds the remnants of those barracks and buildings as clearly visible ground disturbances under the canopy of the dense forest that has grown there since. And then there are also these bumps that look like bomb craters. Are those from the American bombing raid on August 24, 1944? Aerial images show mostly forest. But the foundations of the destroyed buildings of the former concentration camp are visible in the DTM. They match the building footprints of this visitor map to the memorial site. We are still not entirely sure what those “bumps” arem but our initially assumption that all of those would have to be bomb craters from that fatal American bombing raid on August 24, 1944 seems to be wrong. Below is a close-up with lasview of the triangulated and shaded ground points from the lower right corner of tile ‘las_656_5654_1_th_2010-2013.laz’. Close-up in lasview on the bumbs in the ground. We are not sure if all the bumps we can see here are there for the same reason. But we found an old map and managed to overlay it on Google Earth. It suggest that at least the bigger bumps are not bomb craters. On the map they are labelled as “Erdfälle” which is German for “sink hole”. The big bumps in the hillshaded DTM are not bomb craters. They are labelled as “Erdfälle” (sink holes) in this older map. We got a reminder on the danger of demagogues as well as a glimpse into conflict archaeology and geomorphology with this open LiDAR download and processing exercise. If you want to explore this area any further you can either download the LiDAR and download LAStools and process the data yourself or simply get our KML files here. This is the first part of a series on how to process the newly released open LiDAR data for the entire state of North Rhine-Westphalia that was announced a few days ago. Again, kudos to OpenNRW for being the most progressive open data state in Germany. You can follow this tutorial after downloading the latest version of LAStools as well as a pair of DGM and DOM files for your area of interest from these two download pages. We have downloaded the pair of DGM and DOM files for the Federal City of Bonn. Bonn is the former capital of Germany and was host to the FOSS4G 2016 conference. As both files are larger than 10 GB, we use the wget command line tool with option ‘-c’ that will restart where it left off in case the transmission gets interrupted. The DGM file and the DOM file are zipped archives that contain the points in 1km by 1km tiles stored as x, y, z coordinates in ETRS89 / UTM 32 projection as simple ASCII text with centimeter resolution (i.e. two decimal digits). 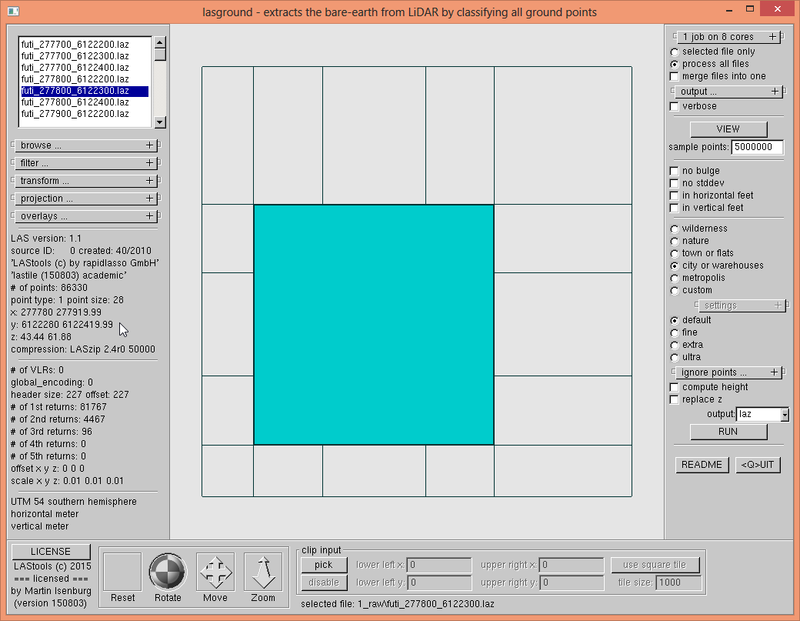 There is more than one tile for each square kilometer as the LiDAR points have been split into different files based on their classification and their return type. Furthermore there are also synthetic points that were used by the land survey department to replace certain LiDAR points in order to generate higher quality DTM and DSM raster products. The point coordinates are is in EPSG 5555, which is a compound datum of horizontal EPSG 25832 aka ETRS89 / UTM zone 32N and vertical EPSG 5783 aka the “Deutsches Haupthoehennetz 1992” or DHHN92. We add this information to each *.laz file during the LASzip compression process with the command line options ‘-epsg 25832’ and ‘-vertical_dhhn92’. LASzip reduces the file size by a factor of 10. The 956 *.laz DGM files compress down to 4.3 GB from 43.5 GB for the original *.xyz files and the 244 *.laz DOM files compress down to 4.8 GB from 47.8 GB. From here on out we continue to work with the 9 GB of slim *.laz files. But before we delete the 90 GB of bulky *.xyz files we make sure that there are no file corruptions (e.g. disk full, truncated files, interrupted processes, bit flips, …) in the *.laz files. 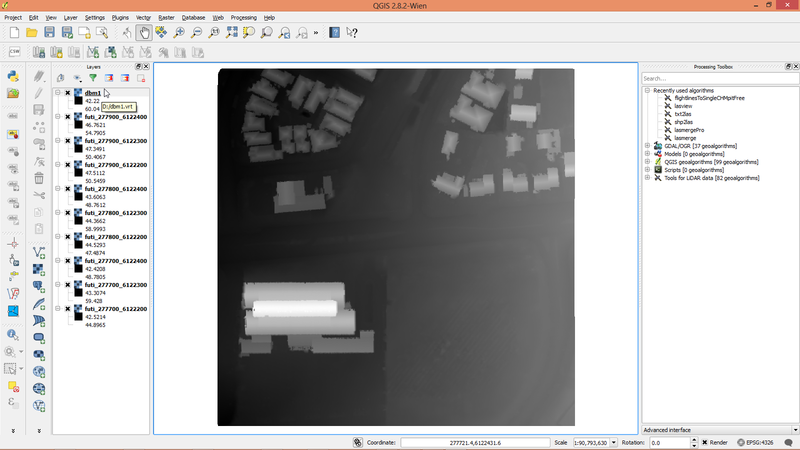 One advantage of having the LiDAR in an industry standard such as the LAS format (or its lossless compressed twin, the LAZ format) is that the header of the file stores the number of points per file, the bounding box, as well as the projection information that we have added. This allows us to very quickly load an overview for example, into lasview. 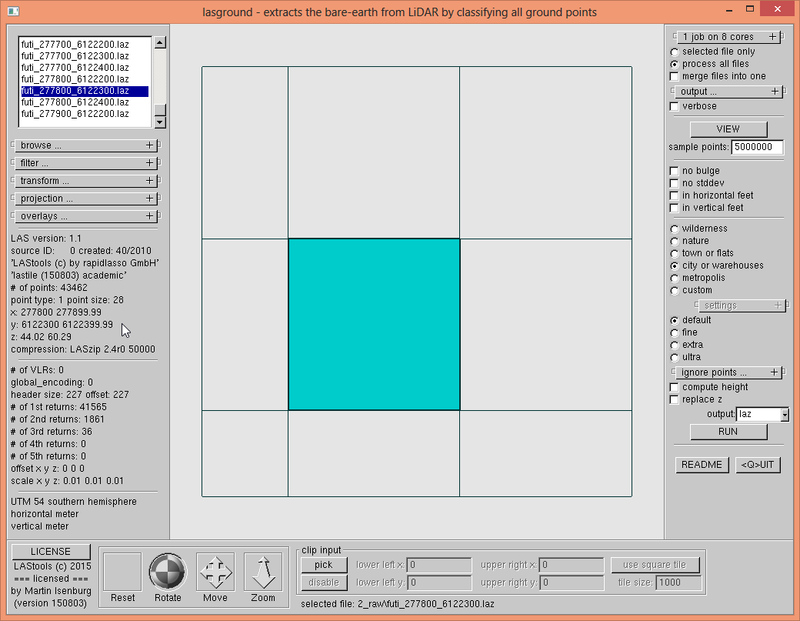 The bounding boxes of the DGM files quickly give us an overview in the GUI when the files are in LAS or LAZ format. Now we want to find a particular site in Bonn such as the World Conference Center Bonn where FOSS4G 2016 was held. Which tile is it in? We need some geospatial context to find it, for example, by creating an overview in form of KML files that we can load into Google Earth. We use the files from the DOM folder with “fp” in the name as points on buildings are mostly “first returns”. See what our previous blog post writes about the different file names or look at the second part of this series. We can create the KML files with lasboundary either via the GUI or in the command line. Only the “fp” tiles from the DOM folder loaded the GUI into lasboundary. 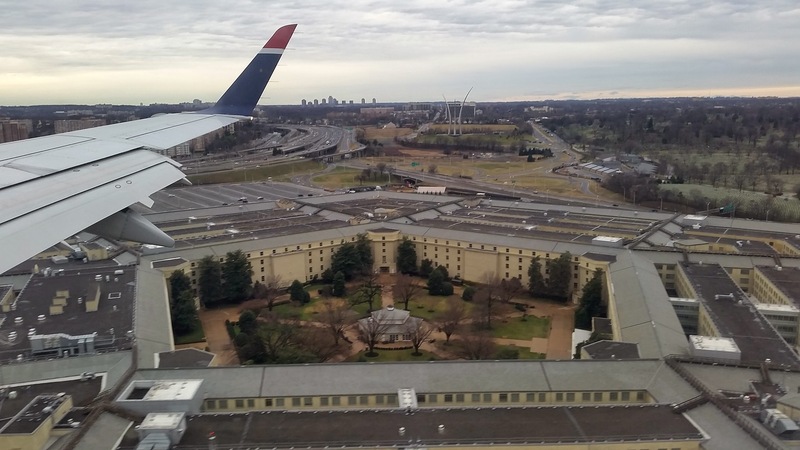 We zoom in and find the World Conference Center Bonn and load the identified tile into lasview. Well, we did not expect this to happen, but what we see below will make this series of tutorials even more worthwhile. There is a lot of “high noise” in the particular tile we picked. We should have noticed the unusually high z range of 406.42 meters in the Google Earth pop-up. Is this high electromagnetic radiation interfering with the sensors? There are a number of high-tech government buildings with all kind of antennas nearby (such as the United Nations Bonn Campus the mouse cursor points at). Significant amounts of high noise are in the first returns of the DOM tile we picked. But the intended area of interest was found. You can see the iconic “triangulated” roof of the building that is across from the World Conference Center Bonn. The World Conference Center Bonn is across from the building with the “triangulated” roof. 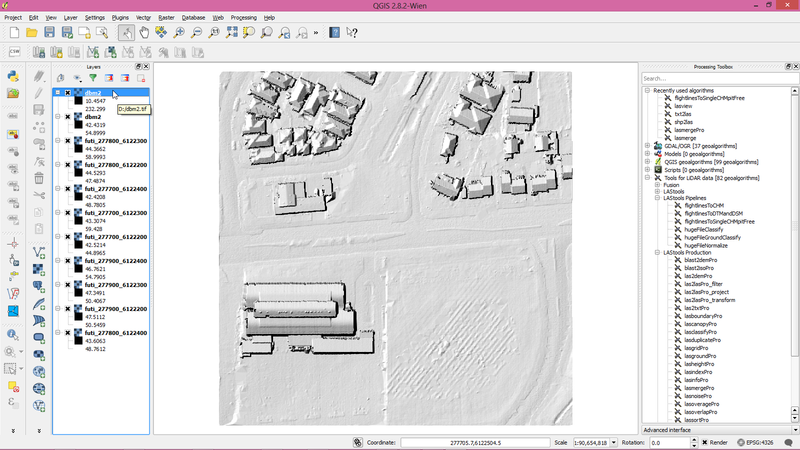 UPDATE: (January 6th): Our new tutorial “downloading Bonn in LiDAR“. UPDATE: (January 9th): Now a second state went open LiDAR as well. More and more countries, states, and municipalities are deciding to make their LiDAR archives accessible to the general public. Some are doing entirely for free with instant online download and a generous open license that allows data sharing and commercial use. Others still charge a “small administrative fee” and require filling our actual paperwork with real signatures in ink and postal mailing of hard drives that can easily take half a year to complete. Some licences are also stricter in terms of data sharing and commercial use. And then there was Germany where all the LiDAR data has traditionally been locked up in some cave by the 16 state survey departments and was sold for more than just a fee. Financial reasons would usually prohibit residents in Germany from making, for example, an elevation profile for their favorite mountain bike trail for hobby purposes. Or starting a small side business that (for 5 Euro a sheet) sells “Gassi Maps” with elevation-optimized dog walking paths of low incline that go past suitable potty spots and dog-friendly coffee shops. The reason that many national and state mapping agencies have opened their LiDAR holdings for free and unencumbered access are manifold. A previous blog post had looked at the situation in England whose Environment Agency also used to sell LiDAR data and derivatives. The common argument that government agencies have been using to justify selling data (paid for with taxes) to those very same tax payers was that this would be used to finance future surveys. It was the “freedom of information” request by Louise Huby on November 21st, 2014 that exposed this as a flawed argument. The total amount of revenue generated for all LiDAR and derivatives sales by the Environment Agency was just around £323,000 per year between 2007 and 2014. This figure was dwarfed by its annual operational budget of £1,025,000,000 in 2007/08. The revenue from LiDAR sales was merely 0.03 percent of the agencies’s budget. That can maybe pay for free coffee and tea in the office, but not for future airborne LiDAR flights. The reaction was swift. In September 2015 the Environment Agency made all their DTM and DSM rasters down to 0.25 meter resolution available online for open access and in March 2016 added the raw point clouds for download in LAZ format with a very permissible license. 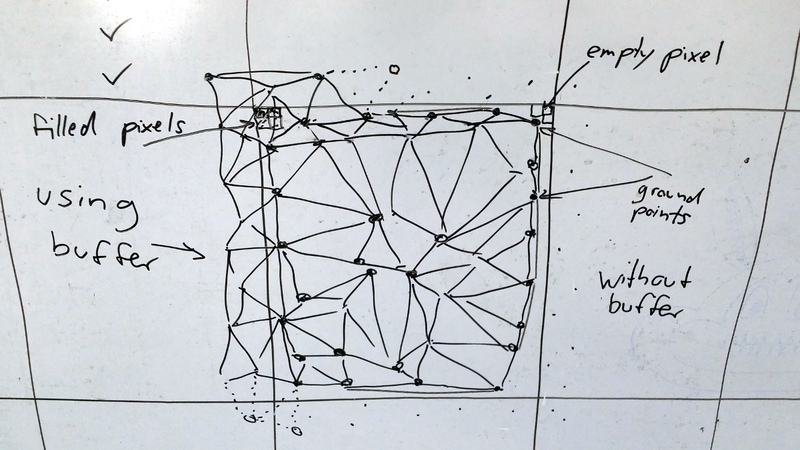 It has since been an incredible success story and the Environment Agency has been propelled into the role of a “champion for open data” as sketched in my ACRS 2016 keynote talk that is available on video here. LiDAR acquisitions are expensive and while it would be interesting to also find out how much each state has actually spent on airborne surveys over the past years (another “Frag den Staat” request anyone? ), it is obvious that the reported revenues are just a tiny fraction of those costs. Exact details of the reported revenue per year can be accessed via the links to the information requests above. The cost table of each answer letter is copied below. However, it’s not all bad news in Germany. Some of you may have seen my happy announcement of the OpenNRW initiative that come January 2017 this would also include the raw LiDAR points. And did it happen? Yes it did! Although the raw LiDAR points are maybe a little tricky to find, they are available for free download and they come with a very permissible license. The license is called “Datenlizenz Deutschland – Namensnennung – Version 2.0” or “dl-de/by-2-0” and allows data and derivative sharing as well as commercial use. It merely requires you to properly name the source. For the LiDAR you need to list the “Land NRW (2017)” with the year of the download in brackets as the source and specify the data set that was used via the respective Universal Resource Identification (URI) for the DOM and/or the DGM. The OpenNRW portal now also offers the download of the LiDAR “punktwolke” (German for point cloud). We download the two smallest zipped files DGM and DOM for the municipality of Wickede (Ruhr) to have a look at the data. The point cloud is in EPSG 5555 which is a compound datum of horizontal EPSG 25832 aka ETRS89 / UTM zone 32N and vertical EPSG 5783 aka the “Deutches Haupthohennetz 1992”. The contents of the DGM zip file contains multiple files per tile. 14 files with “ab” in the name contain very few points. They look like additional points for under bridges. The “b” is likely for “Brücke” (German for “bridge”). 38 files with “ag” in the name contain seem to contain only points in areas where buildings used to cover the terrain but with ground elevation. The “g” is likely for “Gebäude” (German for “building”). 30 files with “aw” in the name contain seem to contain only points in areas where there are water bodies but with ground elevation. The “w” is likely for “Wasser” (German for “water”). 14 files with “brk” in the name also contain few points. They look like the original bridge point that are replaced by the points in the files with “ab” in the name to flatten the bridges. The “brk” is also likely for “Brücke” (German for “bridge”). 42 files with “lpb” in the name. They look like the last return LiDAR points that were classified as ground. The “lpb” is likely for “Letzter Pulse Boden” (German for “last return ground”). 42 files with “lpnb” in the name. They look like those last return LiDAR points that were classified as non-ground. The “lpnb” is likely for “Letzter Pulse Nicht Boden” (German for “last return not ground”). 32 files with “lpub” in the name contain very few points. They look like the last return points that are too low and were therefore excluded. The “lpub” is likely for “Letzter Pulse Unter Boden” (German for “last return under ground”). 42 files with “fp” in the name. They look like the first return LiDAR points. The “fp” is likely for “Frühester Pulse” (German for “first return”). If you use all these points from the DOM folder your get the nice DSM shown below … albeit not a spike-free one. A triangulated first return DSM generated mainly from the file “dom1l-fp_32421_5705_1_nw.laz” with the points from “dom1l-aw_32421_5705_1_nw.laz” for areas with water bodies shown in yellow. UPDATE (January 5th): The folks at OpenNRW just tweeted us information about the organization of the zipped archives in the DTM (DGM) and DSM (DOM) folders. We guessed pretty okay which points are in which file but the graphic below (also available here) summarizes it much more nicely and also tells us that “a” was for “ausgefüllt” (German for “filled up”). 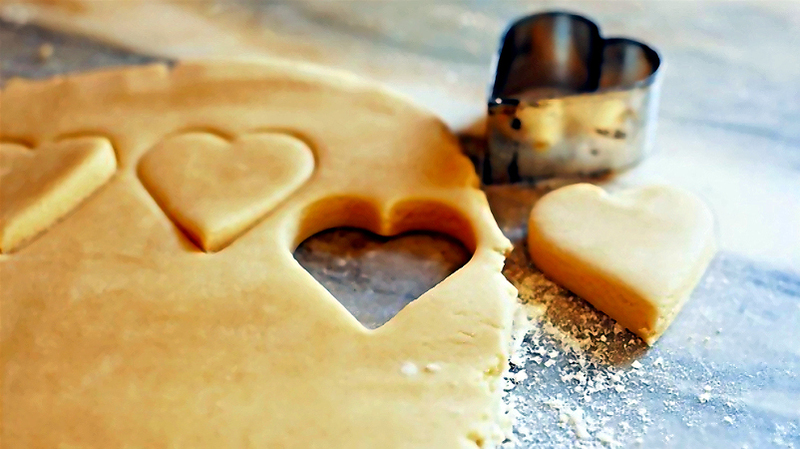 Maximally two returns per pulse are available: either a single return or a first return plus a last return. There are no intermediate returns, which may be an issue for those interested in vegetation mapping. Nice illustration of which LiDAR point is in which file. All files with ‘ab’, ‘ag’, or ‘aw’ in the name contain synthetic points that fill up ground areas not properly reached by the laser. A Digital Surface Model (DSM) represents the elevation of the landscape including all vegetation and man-made objects. An easy way to generate a DSM raster from LiDAR is to use the highest elevation value from all points falling into each grid cell. However, this “binning” approach only works when then the resolution of the LiDAR is higher than the resolution of the raster. Only then sufficiently many LiDAR points fall into each raster cell to prevent “empty pixels” and “data pits” from forming. For example, given LiDAR with an average pulse spacing of 0.5 meters one can easily generate a 2.5 meter DSM raster with simple “binning”. But to generate a 0.5 meter DSM raster we need to use an “interpolation” method. Laser pulses and discrete returns of four fightlines. (1) Using only first returns means not all LiDAR information is used and some detail is missing. This is particularly the case for off-nadir scan angles in traditional airborne surveys. It becomes more pronounced with new scanning systems such as UAV or hand-held LiDAR where laser beams no longer come “from above”. Furthermore, in the event of clouds or high noise the first returns are often removed and the remaining returns are not renumbered. Hence, any laser shot whose first return reflects from a cloud or a bird does not contribute its highest landscape hit to the DSM or CHM. (2) Using all first returns practically guarantees the formation of needle-shaped triangles in vegetated areas and along building roofs that appear as spikes in the TIN. This is because at off-nadir scan angles first returns are often generated far below other first returns as shown in the illustration above. The resulting spikes turn into “data pits” in the corresponding raster that not only look ugly but impact the utility of the DSM or CHM in subsequent analysis, for example, in forestry applications when attempting to extract individual trees. In the following we present results and command-line examples for the new “spike-free” algorithm by (Khosravipour et. al, 2015, 2016) that is implemented (as a slow prototype) in the current LAStools release. This completely novel method for DSM generation triangulates all relevant LiDAR returns using Contrained Delaunay algorithm. This constructs a “spike-free” TIN that is in turn rasterized into “pit-free” DSM or CHM. This work is both a generalization and an improvement of our previous result of pit-free CHM generation. We now compare our “spike-free” DSM to a “first-return” DSM on the two small urban data sets “france.laz” and “zurich.laz” distributed with LAStools. Using lasinfo with options ‘-last_only’ and ‘-cd’ we determine that the average pulse spacing is around 0.33 meter for “france.laz” and 0.15 meter for “zurich.laz”. We decide to create a hillshaded 0.25 meter DSM for “france.laz” and a 0.15 meter DSM for “zurich.laz” with the command-lines shown below. The differences between a first-return DSM and a spike-free DSM are most drastic along building roofs and in vegetated areas. To inspect in more detail the differences between a first-return and our spike-free TIN we use lasview that allows to iteratively visualize the construction process of a spike-free TIN. Pressing <f> and <t> constructs the first-return TIN. Pressing <SHIFT> + <t> destroys the first-return TIN. Pressing <SHIFT> + <y> constructs the spike-free TIN. Pressing <y> once destroys the spike-free TIN. Pressing <y> many times iteratively constructs the spike-free TIN. One crucial piece of information is still missing. What value should you use as the freeze constraint of the spike-free algorithm that we set to 0.9 for “france.laz” and to 0.5 for “zurich.laz” as the argument to the command-line option ‘-spike_free’. The optimal value is related to the expected edge-length and we found the 99th percentile of a histogram of edge lengths of the last-return TIN to be useful. Or simpler … try a value that is about three times the average pulse spacing. Khosravipour, A., Skidmore, A.K., Isenburg, M. and Wang, T.J. (2015) Development of an algorithm to generate pit-free Digital Surface Models from LiDAR, Proceedings of SilviLaser 2015, pp. 247-249, September 2015. Khosravipour, A., Skidmore, A.K., Isenburg, M (2016) Generating spike-free Digital Surface Models using raw LiDAR point clouds: a new approach for forestry applications, (journal manuscript under review).